OUT - Bigger is Better! Once Upon a Tree is a small company founded by Paul Cerny, based out of Houston Texas. He creates some amazing hand-crafted wooden skill toys (The VooDama) and beautiful fixed-axle yo-yos. His latest creation is the Free Spirit! 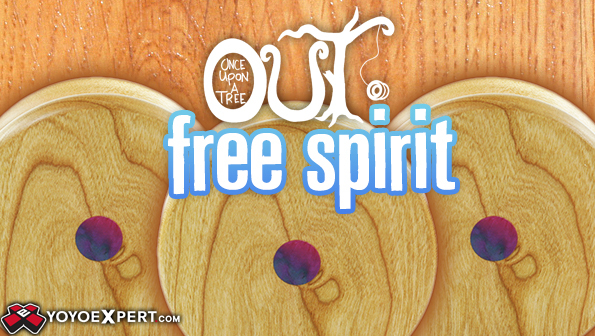 The Free Spirit is a large and in charge non-comformist yo-yo that doesn't care what all the other yo-yos are saying about it. With the oversized 3 inch diameter this yo-yo is surprisingly playable, but with the heavy weight that comes with the size it is not recommended for the novice fixed yo-yoer - this thing will beat you up if you let it! The Free Spirit is definitely not your typical wooden fixed-axle, but once you throw this heavyweight you will be hooked! Weight Varies w/ Wooden Yo-Yos.